The development and importance of agricultural mechanics. 2. Physical properties of agricultural materials. Shape and size. Surface area. Volume and density. Thermal and hygroscopic expansion. 3. Mechanical properties. 4. Thermal properties. Specific heat. Heat-conduction coefficient. Temperature conductivity. 5. Electrical properties. Dielectric constant and dielectric loss. 6. Optical properties. Reflectance properties. Transmittance properties. 7. Water storage in agricultural materials. Physics of water storage. Adsorption and desorption of water. Equilibrium moisture content. Moisture adsorption by hygroscopic materials. Internal moisture movement. Mass-transfer at the surface. Mass-transfer coefficients. Moisture gradients. Contact moisture exchange. The theory of drying. General relationships in the drying process. Heating and cooling of deep piles. Heat production in biological materials during storage. Moisture exchange of fruits and vegetables with the air. 8. The background of rheology. Characteristics of biological materials. Ideal materials and their properties. Time-dependent behavior of materials; viscoelasticity. Creep. Recovery. Relaxation. Linearity. Rheological models. Rheological equations. Integral representation of viscoelastic constitutive equations. Behavior of viscoelastic materials under oscillating loads. Nonlinear constitutive equations. Temperature effects. Non-Newtonian fluids; viscosimetry. 9. Contact stresses. Contact stress in elastic bodies. Contact stress in viscoelastic bodies. The theory of the rigid dye; the Boussinesq problem. 10. Impact loading. Impact of elastic bodies. Impact of viscoelastic bodies. Application of cushioning materials. 11. The finite-element method. Concept of the method. Shapes of elements and the displacement function. Embedding the elements into the continuum. Finite element formulation. Viscoelastic stress analysis; numerical method. Application of the finite-element method to flow fields. 12. Application of rheology. Force-deformation relationship. Stress-strain relationships. 13. Mechanical damage. Causes and the forms of appearance of damage. Biological and chemical reactions after damage. Establishing and measuring damage. Effect of moisture changes on damage. Impact damage. Effects of various parameters on sensitivity to damage. 14. Aerodynamic and hydrodynamic properties and phenomena. Aerodynamic drag coefficent. Terminal velocity. Aerodynamic resistance of granular bulk materials. Separation of foreign materials. Pneumatic conveying of agricultural materials. Fluid bed conveying. Conveying by throwing. Pneumatic conveying of Non-Newtonian materials. Flow in perforated ducts. Ventilation of bales and stacks. Non-Newtonian flow in tubes. Air resistance of fruit-tree crowns. Hydrodynamic properties. 15. Friction problems. General laws of friction. Friction coefficients of agricultural materials. Rolling of agricultural products. Angle of internal friction and angle of natural repose. State diagram for granular bulk materials. Stress state of granular bulk materials. Pressure distribution in bins. Flow of granular materials from an orifice. Flow of granular materials in chutes. Further friction problems. 16. Wafering and pressing of agricultural materials. General relationships for pressing processes. Energy requirements of pressing. Rebound of material after pressing. Pressure distribution in the space before a compressing piston. Pressure conditions in pelleting machines. Effects of various parameters on the pelleting process. Mechanical dewatering of agricultural materials. 17. Cutting of agricultural materials. Cutting methods. Deformations caused by cutting. Energy requirements of cutting. Free cutting. Energy requirements of forage harvesters. 18. Grinding (comminution) of agricultural materials. Mechanism of comminution. General relationships for hammer mills. Size distribution of comminuted products. Energy requirements of hammer mills. Closed-circuit grinding. Grinding of forage materials. References. Subject Index. The importance of economical production of agricultural materials, especially crops and animal products serving as base materials for foodstuffs, and of their technological processing (mechanical operations, storage, handling etc.) is ever-increasing. During technological processes agricultural materials may be exposed to various mechanical, thermal, electrical, optical and acoustical (e.g. ultrasonic) effects. To ensure optimal design of such processes, the interactions between biological materials and the physical effects acting on them, as well as the general laws governing the same, must be known. The mechanics of agricultural materials, as a scientific discipline, is still being developed, and therefore has no exact methods as yet, in many cases. However, the methods developed so far can already be utilized successfully for designing and optimizing machines and technological processes. This present work is the first attempt to summarize the calculation methods developed in the main fields of agricultural mechanics, and to indicate the material laws involved on the basis of a unified approach, with all relevant physico-mechanical properties taken into account. The book deals with material properties, gives the necessary theoretical background for description of the mechanical behaviour of these materials including modern powerful calculation methods and finally discusses a large number of experimental results. Many of them can only be found in this book. Special attention is paid to the unified approach concerning theory and practice. 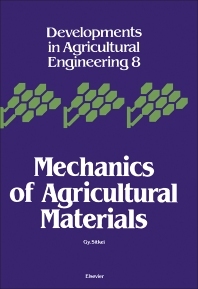 The systematic treatment of the material makes the book useful to a wide circle of designers, researchers and students in the field of agricultural engineering. The book can also be used as a textbook at technical and agricultural universities.